If you look at our short time on the planet, one thing is blatantly obvious. Our days on this planet are numbered. History is full of examples of empires that have collapsed. 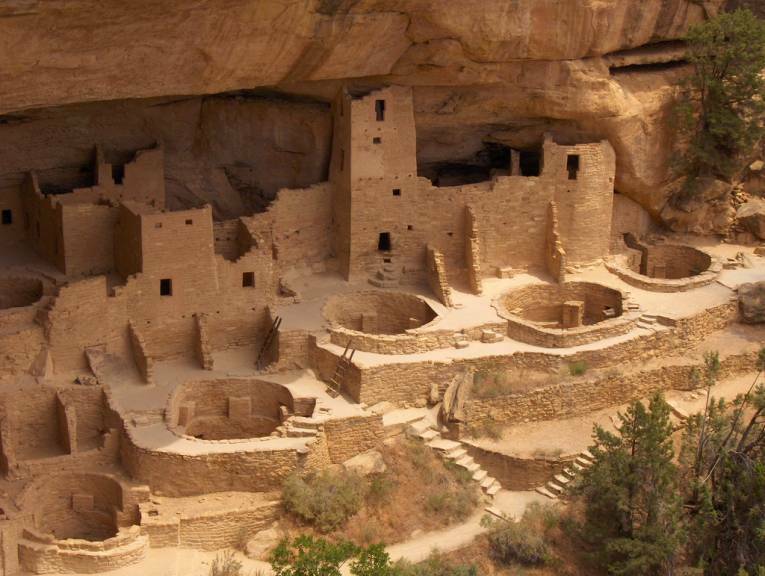 From the Anasazi civilization in Chaco Canyon in now New Mexico and the Mayan Empire of Central America to the Tang and Ming Dynasties of China. Through the millennia civilizations have grown, flourished and collapsed. These cultures were considerably more advanced than the other populations of their times…this is why they became empires. But all these empires had a massive flaw in them, just like our world today, those empires were controlled by humans that were intent on subduing the planet and not existing as part of a community living on the planet. There is no question that at first these civilizations achieved greatness and initially changed and controlled the Earth for a while. But after their allotted period of time all of these empires crumbled and finally collapsed back into the oblivion from which they came. Not convinced? When was the last time you spoke to a Hittite or Akkadian? These empires were washed away by the ravages of time. It is all because we tried to subdue the planet to our will and not exist on it peaceably. Europe before they discovered the Americas was overpopulated and in trouble. The natural world had been completely eradicated and the peoples of the time were in constant conflict with each other. Wars between countries were always raging and precious limited natural resources were being squandered at an appalling rate. Climate change impacted the populations then too, but our overall population was smaller and we could expand or change our habits to accommodate our situation. But as our population became too big to manage, we have sadly run out of the ostrich head in the sand option. 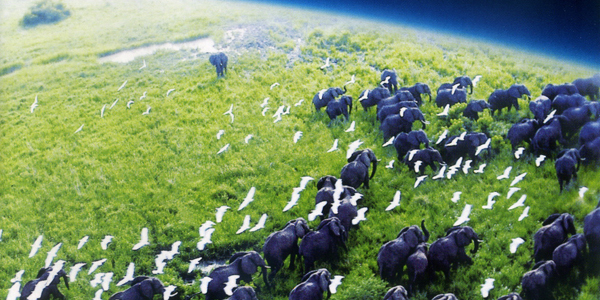 We have no place to expand and the size of our populations magnifies the natural changes of the world exponentially. The Europeans had been moving down the path of ruin for quite some time before the advent of the “New World”. But with it’s discovery to the Europeans and it’s vast resources only postponed judgement day. Postponed…not cancelled. Now once again humanity’s bulging population is creating massive problems for the inhabitants of the planet. All of our cars, factories, homes, etc…are pumping in greenhouse gases into our atmosphere at an alarming rate that is unprecedented in our history on the planet. This is probably because our population has never been so big. We are running out of room for expansion on this planet. Unless we move into the oceans (which we have been using as a dump for millennia or manage to leave this planet) we are doomed. We have never developed the Land Ethic mindset that we so desperately need to survive and coexist of Earth. Throughout history mankind has destroyed his surroundings. All animals will. Too many deer will destroy their food base and they soon starve. We found out in the early 1900’s that natural checks and balances are needed to keep ecosystems healthy and populations in check. With our ability to modify our environment our population growth accelerated but we are still subject to the laws of nature no matter how special we think we are. Some time in the not so distant future the human race is destined to follow the woolly mammoth, saber toothed tiger, etc…they all past on into oblivion from man’s hands and soon we will follow. Stephen Hawking announced this week that he believes that humans only have about a century left before we annihilate ourselves. We keep talking about stepping out into space. Well it hasn’t happened yet and we have been talking about this very thing for generations. Even if we can reach for the stars and head out into space…NOT ALL OF US ARE GOING! There are over 7,000,000,000 of us on this planet and we would be deluding ourselves to think that we would all be whisked off to another planet to wreak mayhem there too. I agree with Hawking, mankind’s tenure on this planet is quickly coming to an end. Today there is a political battle brewing pertaining to the ideal size of the federal government. Conservatives feel that the federal government should be minimal as stated in the Constitution and liberals feel that it should be expanded to cover many safeguards for health care, environmental issues, education, etc… The conservatives feel that those issues are important and do not belittle them, but they also feel that these issues fall under the control of the state governments . Land has been set aside to be conserved and protected by both the state and federal governments. The country watch as Ammon Bundy and a group of armed men took over the BLM lands (Malheur National Wildlife Refuge) in Oregon. They were protesting the control of these lands by the federal government. This incident highlighted the strong beliefs of many citizens of America. They believe that the federal government should get it’s hands off the states’ lands. The problem that arises with this is simple, who is going to maintain and protect our lands? The BLM (Bureau of Land Management) has been under fire almost since its inconception in 1946. The Bureau manages 265,000,000 acres of land or roughly 1/9th of our nations property. This group of people argue that each individual state would do a better job tending their own lands,. But at the same time, the Adirondack State Park in New York has been under constant attack since its creation on 15 May 1885. It is painfully obvious that people do not like regulations of any kind. Unfortunately, we have historically never taken care of our lands without some form of governmental arm twisting. We are dismantling our environmental safeguards at an alarming rate because we do not want to be told what to do. We claim that we can determine what is good for the world and protect on our own. But can we? It is like listening to people who say we need to take care of Americans first, but when you ask them what they have done for our fellow countrymen and the silence is deafening! The same group that wants to minimize the government will use the excuse that they do not need to care for the neighbor because that is what their government should do. It is clear that we are really not too sure what we need to do. We have a rough enough time getting 3 of us to agree on something, but our country has over 340,000,000 people in it and we are growing. We all tend to focus on our own selfish desires and forget about what is truly important until it is too late. How often do will neglect our family or loved ones? We love these people in our lives but we get too zoned in on earning money and trading our time on the planet for money. Soon the wealthy will be dictating to you what you can and cannot do…we have already moved in that direction and we buckle this idea too. The company Nestle hopes to be able to force us to buy our own drinking water. Money and profits drives us and protecting there is no money in protecting the Earth. The North American crown jewels, our national parks are even under attack. These are unique places on the globe that are precious and fragile and we are contemplating their destruction for a quick buck. Once again our drunken sailor mentality is taking control of our better judgement. But we can achieve global protection without forfeiting our control. If you do not want to be dictated to about good stewardship, then step up to the plate and do it without being dictated to by some large far-reaching bureaucracy. Each one of us can have a positive effect on our world by the choices we make. If you value a healthy herd of deer then manage for the species. Make decisions that will positively impact the creature of your choice. Form loose associations with like-minded neighbors to have a greater impact…this is the whole premise of local hunting clubs. If you do not have enough acreage for deer then manage for Monarch Butterflies…but do something. The natural world that we are surrounded by is being greatly influenced by our presence and it is changing way too fast. It has been said that over half of the species that exists today will be extinct within a century due to our insatiable appetite to consume ourselves out of existence. Pick a species that you care passionately about and create islands of habitat. Make some of your own property a sanctuary that is so desperately needed for our fellow Earthly inhabitants. We need to get away from the Biblical mindset of subduing the Earth and subjecting it to our desires. Whenever that happens disaster follows closely on its heels. Once again, we need to act like we are a part of Creation and not all of Creation. It is time to put the Land Ethic into action! There is so many different topics I can focus on right now. I could focus on our new administration gutting all the environmental safeguards that we have developed from the past 2 centuries in order to increase the GNP. Or I could focus on the fact that the search for the almighty dollar has opened our world up to much more abuse. I could focus on the tragic story of rhino that was killed in a zoo near Paris for its horn. Instead, I am going to focus on an event that happened here in northern New York State this winter. 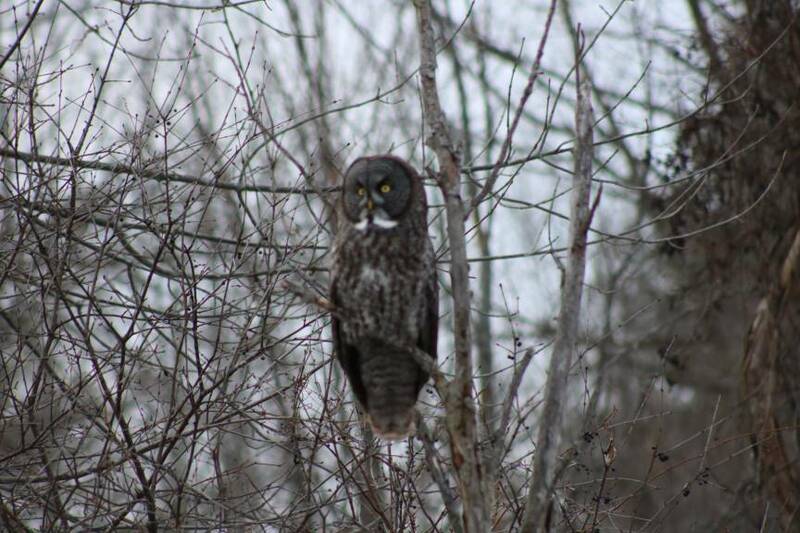 During the winter of 2017, we have had a massive eruption of Great Grey Owls coming down from the Taiga in search of an abundant supply of food. Great grey owls visit us on rare occasions, generally in large numbers every twenty or so years when there is a food shortage up north. When they do make the trip south of the border, they are generally met by an army of over enthusiastic birders that are intent on seeing the species. Some of these birders will inevitably chase the bird around mercilessly in order to get it on their precious list or to photograph the hapless visitor. This said, most birders are ethical and respectful of the well-being of the individual (that is just trying to eek out a meager living doing a winter season). But with the onslaught of this ragtag army of rabid birders comes the few that are unethical or clueless as to the proper manners they should display. Through the decades I have watch in horror as a few birders have announced to the world the bird’s exact location so that others can experience viewing a new and rare sight. This is admirable that they are trying to allow others a chance to view something so rare, but unfortunately it generally turns out bad for their quarry. People have thrown snowballs, drug rats on strings, used squeakers or walked directly at the bird in order to flush it for that important action shot. These birds are not here to present a photo op to anybody but to enhance it’s survival. In their exuberance for that “once in a lifetime experience” this tends to be forgotten. The internet is far reaching and often the locations are posted with the thought that only certain folk will see the posting…but everybody can see the post. After every posting, there is the inevitable whining that people are too blase and cavalier about the well-being of our guest. I have never posted locations and have often suggested this idea to the throng at large. This suggestion has been met with a wide variety of responses. To their credit, the majority of birders are genuinely concerned for the individual birds health but there is a small group that takes advantage of this bird’s presence to take endless photographs that do the individual bird or species any good what so ever. They are more interested in acquiring an imagine of the bird than they are about its overall health and well-being. 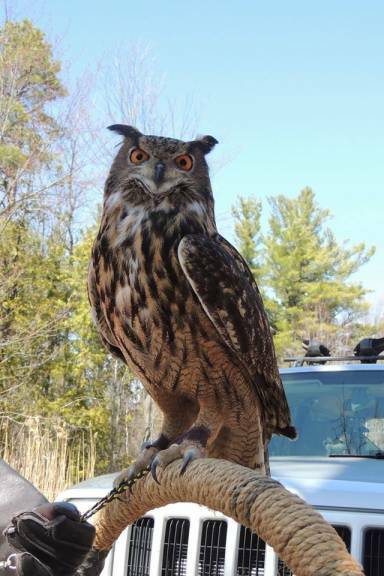 Years ago I banded a visiting northern hawk owl and received several messages complaining that I chased the bird away. I have participated in Project Snowstorm where we have do the same thing with snowy owls. The few complaint I have received basically complain that the bird will no longer sit still so that they can crawl directly underneath its perch. These are the same people that have the cannons for telescopic lenses and came get the same shot if they just showed patience. I have suggested that if people feel compelled to post locations then it is on them to protect our visitor that they just set up for a tougher visit. It was a typical night at the Lake Placid Lodge on 4 February 2017. I was there with my birds to conduct my normal Saturday bird of prey presentation to the interested guests. At the onset, the visit seemed to be just like countless visits I had done in the past ten years. In my routine, I always brought Morley out first and I talked about how amazing he was and what made birds of prey so special. It was finally time to put Morley back in the car and for Tessie to make her weekly appearance. She was waiting in her travel crate in the back of my car along with Scooter and Mortimer. Each bird traveled in a separate travel crate, except for Morley, who sat on the back of the front passenger seat. I reached down to pick Morley up off the perch and he twittered excitedly and stepped onto the glove. I told the guests that I would be back soon and proceeded to walk down the stairs to the first floor. As always Morley perched comfortably on the glove as we made our way through the building to the door. Occasionally Morley would bait off the glove, when the door leading out onto the lower terrace was opened and we walked through. The view from there was spectacular with the snow covered lawn directly below us and the lake stretching out from there to the foot of the snow frosted Whiteface Mountain towering off in the distance. It was at that precise moment that it happened and my typical evening routine was irreversibly altered. Because of Morley’s strength whenever he baited, I would generally hold tightly to his leash and wait till he righted himself on the glove and then we would continue our trek across the stone terrace to the covered stairs and we would work our way down them to my car waiting for us only 100 yards away at the bottom of the hill. However, unbeknownst to me the leather anklets that wrapped around his legs and acted like a dog collar were both sufficiently rotted enough through the past year to have been adequately weakened and when he tugged hard on them…they both tore from his legs and Morley was free. With several strong wing beats he shot over the lawn and banked around the trees and cottages standing at the edge of the lake and he was gone. In a panic I thundered down the stairs to where I had last seen him and desperately searched for my lost friend. It was no good, I didn’t see him and to make matters worse, the sun was just setting and soon it would be dark. I was afraid that I would never see him again and I was sick to my stomach with grief. For you see, to the best of my knowledge, Morley had never hunted in his life and if I could not locate him before too long, he ran the risk of starving to death. An imprinted bird, such as Morley, was used to living with me and would sooner or later seek food from me and if he did not find me, soon he would approach strangers in desperation. Approaching an unknown person was always a dangerous prospect because he ran the risk of being injured or killed by a frightened person that mistook his intentions and felt they were being attacked. Numerous other fates awaited Morley if he was unlucky, such as electrocution, a collision with a car and being attacked by other wildlife. I was in total shock as I frantically searched the trees and cottage roofs in an effort to locate him. I was sure he hadn’t flown far and I needed to locate him quickly, Inevitably, the sun set and darkness enveloped the land. Totally defeated, I numbly dragged myself back up the stairs and into the lodge to collect my possessions and let them know what had happened. As I trudged slowly back up the stairs I had the sickening feeling that he was gone forever. When I arrived back upstairs, I found seated on the chairs where I had been presenting was Kelli, a wildlife photographer, who had come to see my birds and her two friends. Sadly, I informed them of the recent events and they agreed to come down with me and assist in the search. By now the rest of the lodges’ inhabitants were all buzzing about the news of Morley’s escape and were extremely concerned and very sympathetic to my plight. Half an hour into the search, I was talking to Kristel on my track phone organizing a search party for the next day when I suddenly spotted a flash of large wings near one of the cabins a hundred feet away. With my heart pounding, I rushed to the cabin and spotted his silhouette against the moonlit sky. He was sitting on the cabin’s roof and he was scanning the countryside with his great orange eyes. Kelli and her friends surrounded the cabin in order to determine which direction he went if he flew off. Softly I spoke to him and held up a mouse as I tried to coax him to come to me. I am sure that Morley was totally dumbfounded by his new freedom and little bit scared because of his total exposure and vulnerability. The previous visit one week earlier, he had been terrified by fluffy snow blowing off the tree branches above his head, so I imagined that he was very sacred. The concerned folks from the lodge showed up and asked if I could use a ladder. The lodge employees had all watched Morley grow up and they were all very concerned for his well-being. At first I resisted the suggested ladder, but when it became clear that he was not coming to me I agreed and they quickly had a rickety ladder leaning against the one-story cabin that Morley was perched upon. I slowly ascended the unstable aluminum ladder to the snow covered roof trying to make as little noise as possible. When I reached the roof, I realized that there was no way for me to stay on the slippery roof without sliding off so I remained on the ladder at the edge of the structure. With all that activity below his perch, Morley was getting agitated and hopped back and forth from the roof to the chimney. He nervously glanced in my direction and with a flap moved further out of reach atop the chimney. Reluctantly, we moved the ladder to the chimney and as I slowly extended it’s frame skyward, Morley had enough and shot off into the night sky. In a panic we tried to regroup and to trace his route but to no avail it was too dark. Kelli quickly found and flashlight and started searching the nearby trees where she insisted he flew to. I was sure he flew further and searched a pine tree further down the shoreline. After another forty-five minutes of searching in vain, I decided I needed to leave and let Morley settle down. I was sure that an army of well-intentioned souls canvassing the area and flashlight beams scanning the night skies was not helping matters. I asked people to leave so that he would settle down. I also decided to leave and come back early the next day and try to find him. Driving away without him was one of the hardest things I had ever done in my life. But I had to think of my other birds and I could not help him at that moment. I numbly drove the 54 miles to my home and quietly unloaded my other birds. It is my practice to feed them upon our return and realized then, that Morley had only eaten 2 small mice early that morning and that he would be hungry soon. I had decided I needed to eat and get a few hours of sleep before returning to the lodge to start my ill-fated search. By 10:00 PM the phone rang and it was the people from the lodge with news. Morley was hooting next to one of the occupied cabins and they knew where he was perched! They also rose to the occasion and offered the use of one of the unoccupied cabins for me to stay in while I searched. I was back on the road within minutes and renewed my search at midnight. I called out to Morley into the night sky and was answered with a low…HOOT. Within seconds, I was standing under his tree and I could see his head bobbing against the moonlit skies. I held up my gloved hand garnished with a delicious mouse and offered him the snack as an enticement to coax him out of the tree and to me. I spent the next hour talking to him and listening to his hoots. Then he decided to move and with a flash of wings he silently launched himself into the night sky. The gibbous moon illuminated the sky and I stood there helplessly and watched him fly to the roof of the lodge. He was easily 60 feet off the ground and I could see him hop from one of the six chimneys to another as he began to enjoy his new found freedom. It was now 2 in the morning and I knew I needed to sleep if I were to ever hold him again. So reluctantly, I left Morley alone for the second time in six hours. My last glimpse of him frolicking on the rooftop in the cloudy moonlit night made me think of Hogwarts. I crawled into bed thinking that I probably saw the last of Morley and tried to sleep. At 5:00 AM I clamored out of bed to resumed my search. But how would I find him in the frosty landscape? I searched in vain along the lodge roof and saw no romping owl. I called his name and strained to hear a deep HOOT echoing back to me from the murky grounds, but my plaintive call was only met by silence. Slowly, I ascended the stairs and maneuvered to the front of the building and called to him again. This time my efforts were met with a distant and deep…HOOT as he answered me. I rushed to the source of the sound and found him in the pine trees on the edge of a fairway of the golf course. He was flying from one tree to another back and forth across the fairway. I tried desperately to maintain contact with him. My hopes of having a quiet setting in which I could lure him down were soon shattered. The person in charge of maintaining the ski trails came out with a very loud snowmobile and started grooming them. It seemed like everything was working against me. The loud noise startled Morley and he quickly retreated to a more secure location to watched as the frightening machine roared off into the slowly lightening countryside. By now I had a bal chatris baited with dead mice, because that is what he was used to eating and because I had no live bait, and I had set it out underneath him. I was also armed with a mouse in my gloved hand. My goal was to maintain contact with him until he was hungry and then he would come to me. I kept adjusting the trap’s location whenever he moved and once was actually within 10 yards of him as he stood on a fence post and hooted at me. When we hooted he assumed a courtship posture. That encouraged me because he was so bonded to me that I could count on him staying close. I slowly reached the garnished glove out to him and gently cajoled him to come to me. Just when it appeared that he might come to me the snowmobile roared over the ridge and a frightened Morley rocketed off into the ever lightening skies of the new day. The apologetic snowmobile driver had finished grooming the trails and was preparing to leave for the day. He was unaware of the situation and apologized profusely for scaring him off, but I told him that he had no idea what was going on and that I did not fault him. By now the raucous calls of a large murder of crows near the lodge as they alerted me to Morley’s new location. He was only a tenth of a mile from where he originally escaped from me. It appeared that he was reluctant to leave the area and hopefully me. That was very good and maybe I would recapture him after all. I clamored down the freshly snow covered roads to the sound of chaos. It had started to snow around 3:00 AM and by then the ground had a couple inches of fresh puffy snow. People from all over the world come to Lake Placid for such a beautiful scene, but I was oblivious to the beauty of my surroundings and just wanted my feathered pal back safe and sound. I found Morley in a large white pine beside million dollar vacation home that thankfully was not occupied. I was exhausted but needed to maintain contact. Thankfully, reinforcements soon showed up when Kristel and Jessie came answering my frantic phone call from the night before. They helped me maintain eye contact with him as he spent the day in the tree. Sporadically, the crows would return throughout the day to continue their assault on this monstrous owl that had dared to invade their realm. Throughout our watch, there was a steady stream of people checking in on our progress. My phone was constantly ringing with update requests, people from the lodge would stop by and assess our progress, and Wendy came with a larger prey item. Wendy and her family own a wildlife rehabilitation refuge 15 miles from the lodge. Earlier that day I had called her and asked her if she could bring me a medium sized rat. I thought a larger prey item might be more appealing to my wayward friend. She had also recently successfully reacquired her wayward barn owl after a 2 week ordeal, so she knew what I was going through. She had a car full of interns and was heading off to do a presentation of her own so they did not stay long. I was extremely grateful that she made time in her busy schedule to deliver the rat. I was hoping the larger food item would trigger a response. At first Morley appeared to notice the rat, but soon his focus shifted. I had also been in contact with my friend Rick, who owns Morley’s parents and has also gone through the ordeal of desperately searching for a lost bird. Rick suggested that I tie the rat to a long string and drag it in front of him. I only had 5 feet of string but I gamely tried his idea. Once Morley grabbed at the rat as I dragged it along the snow covered roof near his perch. He actually stood only two feet over my outstretched hand as I held up the rat to him. It was nearly 4:00 PM when a very apologetic Kristel announced that they had to leave. I was grateful for their company and assistance during the day. They had answered my call for help and gained my utmost respect. I thanked them for their help and bide them farewell. Upon departure Kristel stated that she might be able to help the next day. Then the she drove up the hill, around the bend and out of sight. It was not long after their departure that Morley began to stir. Soon he was sitting on the roof of the condominium the his perch tree stood in front of. It was now over 30 hours since he ate and the wind was howling, the snow was falling and the temperatures were dropping. To top it all off, the guys responsible for shoveling and clearing away the snow needed to do their job. They had put off clearing this col-de-sac for as long as they could in order to not disturb him, but they needed to finish their rounds. I told them I understood and they quickly went about their business consciously trying not to scare him off. Morley nervously retreated back into the pine and watched them as the noisy truck plowed the street below his lofty perch. The quickly shoveled all the walks and porch except for where Morley was positioned. They agreed that they could do it the next day due to the fact that nobody was occupying it at that moment. I thanked the guys as they left and continued my tireless pursuit. Soon Steve from the lodge appeared, he was extremely fond of Morley and came to offer assistance. But at that moment there was really nothing to be done but sit and wait for Morley to get hungry. As the daylight hours dwindled he hopped back and forth from the tree to the roof. A few times he stood on a fence post beside the back of the building. I tried to get close enough to net him with a large landing net I had brought with me. But just as earlier in the day, when I was a mere 4 steps from him, he flapped his mighty wings and was instantly out of reach. I decided that he was like the teenager that was given the family car and was raveling in his new found freedom. I could tell that he was nervous and scared because he was so expose, but he was also exhilarated with his newly acquire freedom. Once again, the skies had darkened and the wind gusts of 18 miles an hour began to let up. The snow continued to fall and was only slated to stop around 3:00 AM when the temperature was predicted to plummet to several degrees Fahrenheit below zero. Morley looked around at his surroundings and then with a strong downward flap he lifted up and shot over the freshly snow covered road and disappeared into the night. I was cold, discouraged, tired, hungry and feeling defeated as I trudged through the snow clad streets. I slowly plodded back to the lodge to eat something and warm up before I would renewed my search. The folks at the lodge were all extremely interested in how I was progressing. Many of the staff had made a point to stop down every week when we visited to see him and they were genuinely concerned for his well-being. After eating a hot bowl of soup and drinking a hot chocolate I stepped back into the cold night and resumed my quest. Upon leaving the lodge I hastened to where I last saw Morley and hooted to him. No answering hoot met my ears so I continued across a footbridge near his last position and slowly slogged up a steep snowy lane and hooted for him again. All at once the still night was shattered with a very loud HOOT from the very expensive house directly in front of me. By now I had realized that there were only a few occupied domiciles in this community of 200 plus million dollar homes. That encouraged me to hoot into the night with reckless abandon and with little concern about waking the neighbors. Soon I found him again. He was perch on what appeared to be a vent duct on the top of the roof. He hooted and postured at me like usually and then took off yet again. I followed him to a few more locations and finally decided that this was getting me nowhere and so I went back to my cabin to sleep. As I crawled off to bed I muttered a prayer that God watch over Morley and help me catch him and then drifted off to sleep. Rick and Meghan both woke me when they called to check on my progress. Even though I was exhausted I actually was bolstered by their concern. I woke at 3:00 AM, dressed and started my search again. It was now Monday the 6th of February and Morley had been away from me for two full nights. The winds had died down but the temperatures were cold. My mother had gone to my house and taken my dogs to her house, but my other birds needed to be fed and cared for too. I did not want to compound this tragedy by putting any other of my birds at risk. I determined to locate him and wait until it was light and hope that his pattern of moving at night and resting during the day would continue. Despair started to set in after I walked all over the region hooting with no reply from Morley. Finally I dragged myself down the only trail I did not check and uttered my woeful hoot to the winter skies. Seconds dragged on and finally I heard his faint but verydistinctive hoot answering me. With a new spring in my step a hurried off in the direction of the hoot. Occasionally, I would stop, hoot and listen and like a beacon to a lost seafarer Morley hooted back and led me to him. He was perched in a tree over another mansion at the edge of the Whiteface Resort about a quarter of a mile from the lodge where the nightmare had started. I gently spoke to him and offered the rat to him. He hooted, postured several times over the next three quarters of an hour and flew off. Feeling better that at least I knew approximately where he was I went back for a few more hours of restless sleep. It was 5:00 AM when I had returned to the cabin for a few hours of sleep. I awoke at 7:20 AM and hastened back to where I had last seen him. The crews were plowing the roads, but they all stopped to ask about my success. I pulled into circle at the end of the col-de-sac and hooted for him. I was startled when he hooted back from the deck railing on the house directly in front of me. He had only moved a couple houses down from where I had seen him last. He was staring at me from the deck and I slowly approached him holding my offering of rat high in the air. Standing on the snow drift below him, he was perched only a few feet over the rat. I noticed that he was staring longer at the rat but after a prolonged stare he turned his focus on other distractions. I was getting impatient with the game and tried to speed it up by tossing to rat tied to the string near him. Unfortunately, it scared him and he took off toward the back of the deck. Once he was out of sight I heard a loud crash and panicked. Did he break his neck flying into a window I wondered? I had to get up there and check on him. Thankfully, the roof over the garage doors was low enough for me to crawl from the bolder onto the roof and then I slowly moved to where I could see on the deck. Thankfully, he was sitting back on the railing and appeared to be fine. He had collided with the screen from the porch and was undoubtedly stunned. It was only then that I wondered if the home was occupied or not. Thankfully, it was not or I might have been shot or arrested for trespassing. It was time to run home and take care of my other birds, shovel, eat and get cleaned up. I also needed get more provisions for my next stab and reacquiring him. Before I left I stopped in at the Lodge and told Steve where Morley was. Steve worked at the Lake Placid Lodge and was a local. He knew who lived at the house and he knew that they knew me and Morley too. Then I rushed home. On the way I updated everybody and discussed my plan of attack with Rick. Normally, I have pigeons at home that I could have used for bait but a hungry weasel wiped them all out a month ago so I had no live bait to entice him with. I also had to prepare my lesson for my class I taught at Paul Smiths College every Tuesday and Thursday. There was also a winter advisory for Tuesday late afternoon heading into the region. Things were beginning to build up and my window of getting Morley back was rapidly closing and that feeling of dread surfaced again. While I was home I tried to get a rabbit from one neighbor, but nobody was home. The Amish did not have a small enough chicken and the one offer I had for a chicken small enough was way over in Canton. I decided to stock up with a dozen dead rats and then I headed back to find Morley. On the way Kristel called and said she could help again. When I got back to Placid, I immediately ran over to check on Morley. Much to my chagrin, the guys were clearing the snow off the road and had even cleared the driveway of the house were Morley was perching. Thankfully, by now he had gotten used to this activity and had moved to a light on the corner of the deck where he was protected on two sides by the building and the screened in porch. At this location he obviously felt more secure and seemed to be more relaxed. I had also brought a long length of braid string and tried the dragging rat ploy again. He watched it intently for several minutes and then his focus shifted to other things. About this time Steve showed up and made a few suggestions that I knew would only frighten Morley. I mentioned that I was frustrated because I usually have pigeons to that he stated Betsy at the lodge has a barn with pigeons. Filled with new hope I followed Steve back to the lodge to talk to Betsy. She informed me that she did in fact have a barn with pigeons and I would be welcome to grab them. I called a few of my students to line up a pigeon catching expedition, but the only one to show up was faithful Kristel. The barn was in Wilmington about 15 miles away. But upon arrival, my heart sank because there were huge pieces of the walls missing and the pigeons would escape easily with that type of setup. But with no other options I discussed my plan of attack with Kristel and then we hoped to get lucky. We almost succeeded but unfortunately there was just too many escape routes and they all escaped. Kristel then suggested borrowing a chicken from Wendy. We were practically at Wendy’s house in Wilmington so I called her and talk her into lending me their smallest chicken. Unfortunately, it was way too big and I knew Morley, a novice at hunting, would never attack it. But, it was another option. By the time we got back it was very dark so we went to check on Morley. He was gone and he did not answer my call. With that Kristel headed home and I started my nightly sojourn around the Whiteface Club and Resort anxiously searching for my baby. I finally heard a hoot and was lead back to where he spent the day. He was there all the time but must have been reluctant to answer me with Kristel present. I found him on a telephone line hooting and posturing to me. In my rush to find him, I forgot the falconry glove but I still had a rat in my pocket, so I held it up and hooted to him. Soon he flew directly at me and I rapidly tried to devise a way to grab him without him impaling me. Morley would never hurt me intentionally, but if he is scared he will try to defend himself. If I were to have grabbed him that would definitely scare him. So I braced for pain. Fortunately or unfortunately, depending on your viewpoint he passed over me and continued to another perch. He had only been a few feet over the rat. I knew we were getting close, but would it be before the promised storm? He lead me back to the main part of the Resort and closer to where this all started. Finally, I left him for sleep. I slept for a couple hours and then at 3:00 AM resumed my mission. It had been over sixty hours since Morley last ate and he had to have been burning calories at a fast rate with all the activity. So when I headed out I told myself it had to be today. My class was at 12:45 PM, so I only had to 11:30 AM to make it happen and it was all up to Morley. I heard him before I opened the door of the cabin. He had practically traveled a full circle back to where he started. I found him perched on a chimney of the building beside the lodge. I called him several times but even though he started his excited twitter, which he does when I pick him up or feed him, he refused to come down to me. After an unfruitful hour I dragged myself back to rest until 6:00 AM. Within five minutes I had followed his call back to where I was standing under him again. This time he was on the chimney of a huge apartment type condo. He had to be at least fifty feet up and he was hooting and posturing as always. I held up a fresh rat and called. I called him from several sides of the building and finally, he flapped his mighty wings and dropped straight at me. He landed gently on the glove and reached for the rat. I gave him a few seconds so he was fully concentrating on the rat and then I grabbed his leg with my free hand. Thankfully, I remembered to wear the glove and a welding glove for the other hand because he had become scared and he did grab my hand. Immediately, I tucked his wings to his body and held him close to my body making sure to secure his ever dangerous feet with my hands. Once he was secured, I tucked him under my coat and then rushed back to my waiting car. I relaxed alittle once he was confined within the vehicle. I had driven the car to the footbridge when I had ascertained his location. I wanted to have to car available if I did recapture him. As I returned to my cabin approximately two tenths of a mile away I scanned the area to find someone to help me put new jesses on him. Thankfully, I spied one of the guys plowing the roads. I told him of my success and asked him if he would follow me to my cabin where we would put brand new anklets and jesses on him. Morley was not happy to be treated so harshly and when we were done he hooted his displeasure to me. Once the processing was complete. I told the plowman to let him go. Morley tried to fly, but he was now attached to the glove and soon realized that and perched on the glove. I thanked my companion for his help, took and deep breath and walked Morley to the car. He was standing on the glove and after such a horrible ordeal I did not relish the thought of an encore performance. When we stepped out of the cabin, Morley baited from the glove and tugged hard on the new anklets…they held fast and I placed him securely on the back of the passenger seat of my car and quickly tethered him to the seat belt. Once the door was shut, I hurried back to the cabin and gathered my belongings. I actually had enough time to load up, thank to staff at the Lake Placid Lodge and drop off the key and rush home to get Morley safely squared away before my class. The staff at the lodge were amazed and impressed that I had recaptured him. Once again, I thanked them for all they did for me and hurried to my car. I had many things to do before my class and had just enough time to get everything done. I was still wondering what I was going to do with the chicken that was at that moment encases in a trap in the back of my SUV. Morley was hopping from seat to seat and would occasionally stare down at the chicken. It would not do to have him pounce on the chicken and get snared. As I drove toward Saranac Lake some 8 miles away I contacted people to tell them the good news. An agitated Morley was slowly starting to calm down as we drove through the Adirondacks. I offered him a mouse, but he was still to riled up to eat at that point. Miraculously, I ran into Alex, Wendy’s son in Saranac Lake and gave him back the chicken before Morley tried to grab it. Also, Alex had to help me reattach one of the grommets that did not lock on well and had become loose. Upon arriving home, I carefully transferred him back into his mews. He was still slightly excited, but had relaxed considerably. By the time I left for class, he had settled down and was finally ready to eat. He hopped to me and took and ate 2 mice from me and by the end of the day he gulped down a couple more and was back to courting me again. Over the next few days, I have noticed that he appeared to be happy to be back in his familiar home and his bond to me seems stronger than ever. Finally, I made plans to meet Rick on Friday and put on a sturdy pair of anklets made of buffalo hide. I resolved to never experience such a horrid adventure ever again. Luke 2 states that if we cannot be trusted with a little wealth then how can we be trusted with true riches? I feel this is definitely a commentary on our country today. We are so concerned with our own greed that we have lost sight of the bigger picture. 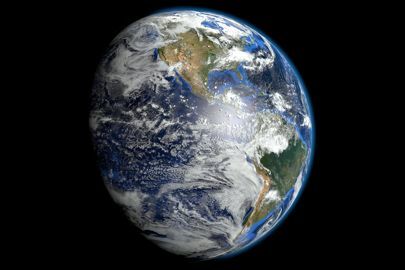 We were given stewardship of this planet and all that is on it and we have done a poor job with our responsibilities to each other and the rest that share the planet with us. Leopold called for us to be better stewards of the planet in his Sand County Almanac and we have not heeded his message. From the farthest reaches of the atmosphere to the depths of the oceans, we will be held accountable for what we have done to each other and to the planet. Human kind has been like a virus infecting the entire Earth and making it sick with our presence. We are like the deer population on the Kaibab Plateau with no checks and balances our population is growing out of control and devastating the rest of the globe. But just like the plateau deer population, we cannot display rampant growth without our day of reckoning. Humans have become the proverbial drunken sailor just interested in gratifying himself at that moment…we are trading in our precious time on the planet for stuff. Stuff that means nothing in the overall scheme of things. We are too busy trying to keep up with the Jones and Smiths to realize that there is nobody at the controls and the train is out of control. Well, the Earth is that train and it is rapidly running out of tracks. The day of reckoning has been developing unheeded for the past generation. For the last 50 years, world population multiplied more rapidly than ever before, and more rapidly than it is projected to grow in the future. In 1950, the world had 2.5 billion people; and in 2005, the world had 6.5 billion people. By 2050, this number could rise to more than 9 billion (see chart “World Population Growth, 1950-2050”). Our population has exceeded 7 billion and will soon be at 8 billion. Just as uncontrolled growth of the deer on the Kaibab in the early 1900s had disastrous consequences on the deer population back then, unfettered human growth will also have serious consequences. Little is expected for those who are given little and much is expected for those given much. We have been given the entire planet to act as stewards to…we are failing miserably. It is thought that by the year 2050 over half of the species that are found on this world will be gone due to our greed and unfettered lusts. The word is not a commodity…it is a community that we are part of and that we are making sick. The day of reckoning is coming and soon like the Dodo, mankind will look out at the rising sun no more. That day is rapidly approaching and we are like children on a toboggan careening toward the cliff oblivious of what awaits us. It has been 70 years since Aldo Leopold’s masterpiece on the “Land Ethic” has been in print. In the “Land Ethic”, Leopold mused that until we stopped seeing land as a commodity and realize that we are all part of the community, we will never protect the land. I have to admit that I was very encouraged by his essay when I was a young man, but have since lost heart and have become quite discouraged and now believe we may never achieve the hallowed ”Land Ethic” that Leopold spoke of with such passion. I find it disheartening to see how we treat each other so poorly and I cannot see how we as a species will ever achieve anything as lofty and noble as the “Land Ethic”. In just the past year we have watched as hatred has spread across the globe and become more acceptable in our own country. Here in the 21st century we still have people sold as slaves ( http://ngm.nationalgeographic.com/ngm/0309/feature1/ ), we still have wars raging around the world (http://www.historyguy.com/21st_century_wars.html ), extinction is running rampant ( http://www.biologicaldiversity.org/programs/biodiversity/elements_of_biodiversity/extinction_crisis/ ) and we humans are finding it easier to rationalize numerous atrocities that we do to our fellow human beings (http://www.ocweekly.com/news/ten-most-heinous-crimes-of-the-decade-6480966 ). Before you say, but those people are sick or that was the exception, not the rule, let me remind you that things are getting worse not better. Look at the average American, they live in a city and many have never even seen the Milky Way. They have no clue where their food actually comes from and are more concerned about the Kardashians than they are about the chemicals we are pumping into are water and air. The CEO of Nestle feels that water is a commodity to be sold not a right (http://www.bottledlifefilm.com/index.php/the-story.html ). We are breeding ourselves into extinction and unfortunately we are like the drunk on the highway…we are happy to take others with us when we go. It is believed that we are causing the 6th massive extinction on the planet (https://www.nytimes.com/2014/02/03/books/the-sixth-extinction-on-endangered-and-departed-species.html?_r=0 ) and all we care about is getting cheaper designer bags and wifi. Whenever we appear to try and solve a problem, someone comes along and blocks our efforts. Recently, the state of Michigan made it illegal to ban plastic bags (https://www.washingtonpost.com/news/energy-environment/wp/2016/12/30/yes-this-is-real-michigan-just-banned-banning-plastic-bags/?utm_term=.fb3382363b4a ) and fools are still arguing that global warming is not a problem. We are still treating the world and all of its creatures as a commodity. Leopold lived during the Dust Bowl and World War I and II. Leopold still saw hope in humanity even after all he had to endure. But I must admit that I do not have the optimism for my fellow human beings. I still hold the “Land Ethic” up as a shining example of what we can achieve. To ever achieve the “land Ethic” we need a total shift to our way of thinking. We need to evaluate ourselves and start focusing on things bigger than ourselves. To start we can look at our own actions. Instead of mowing a whole acre of land for a well manicured lawn, we should leave some uncut. We should plant native species to leave habitat for our fellows on the planet. We can stop using so much and try to eliminate waste whenever possible. We should focus on buying locally…there is less wastes produced when shipping. We should hold our elected officials and companies up to a higher standard. We need to hold ourselves to a higher standard too.